Why does Europe need at last to open its eyes to Russia’s intentions and to believe that the Turkish Stream project will be realized? Global intelligence company Strategic Forecasting Inc. (Stratfor) certainly could not be suspected of loyalty to the Russian initiatives and projects. Stratfor makes economic and geopolitical outlook for large corporations and the US government agencies on the basis of information gathered from official sources and through their own channels. Their analytical information, naturally, intended for the needs of their main customers. So anyone would hardly doubt that Stratfor' work is definitely committed to the interests of the country, in particularly, aimed at restraining Russian energy projects in Europe by any means. However, recently Stratfor probably has surprised everybody with a degree of objectivity of their analytical article about the Russian-Turkish relations and the Turkish Stream gas pipeline project posted on their website under the title “Russia Carries On With Turkish Stream Pipeline”. The main arguments of Stratfor analysts lead to the fact that Russia and Turkey will be able to obtain substantial benefits by building a new gas pipeline in spite of all possible political tempests that are likely to be created by Brussels and Washington to prevent further the construction of this gas pipeline. Stratfor analysts give particular attention to a firm position of the Russian energy company Gazprom, which plans to start constructing the underwater part of the Turkish stream pipeline in June, regardless of whether or not the project will be able to overcome the political obstacles in Europe. In relation to such a prospect, Stratfor notes that Russia has resumed a contract with Germany's company Europipe for 150 thousand tons of pipe for the project. 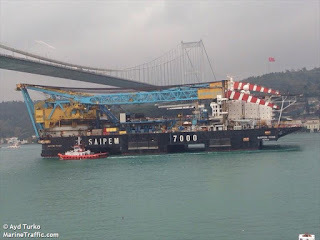 In May, Gazprom also notified a subsidiary of Italian energy company Saipem, that it could begin laying pipes for the planned pipeline in the Black Sea. Two giant energy construction vessels Castoro sei and Saipem 7000 passed through Bosphorus to the Black Sea already at the end of last year to take part in the South Stream project, as shown in the photo. It is important that the underwater part of the Turkish Steam will run mostly along the same route as the proposed South Stream project, which was scrapped last December after the EU objected on the Third Energy Package grounds. Thus, the resources attracted by Gazprom for the South Stream with the minor costs are to be redirected to the Turkish stream. Stratfor analysts also reminded that Gazprom had informed Europe about the plan to cease using its current export route through Ukraine in 2019 and would shift those natural gas supplies to the Turkish Stream pipeline. “But the Europeans – as indicated in the article - believe Russia will not follow through with its plans if Europe does not build the infrastructure necessary to deliver gas from Turkey to the markets currently serviced by the Ukrainian route”. Actually, it is high time now for Europe at last to believe that the Turkish stream capacities will be in demand even if Brussels is going to continue restrictive policies, and European countries do not build a gas transport infrastructure from the border with Turkey. In this case, Gazprom can rely on the future expansion of the Turkish market, as in the next 10 years the demand for blue fuel in Turkey will rise up to the capacity of two lines of the planned pipeline. It means that demand for the Turkish stream gas will be in any case, even if Brussels keeps the policies hampering access of South Europe countries to Russian gas. Meanwhile, clearly showing its intentions, Gazprom has presented the Turkish Stream project at the World Gas Conference, held in Paris and declared Reuters its plans to begin construction later in June. According to the presented information by 2020 the 1,090-kilometre pipeline project, including 180-kilometre of onshore part, is planned to deliver 63 bcm (2.2 tcf) of gas a year to Turkey, of which 47 bcm (1.7 tcf) will be intended for Europe. Indeed, if Europe does not open its eyes to the obvious situation and does believe that Russia is willing to build the Turkish stream, then unnerving challenges will await Europeans after 2019. Because Brussels's politicians just is restricting access of the Southeast part of our continent to energy, especially if we take into account the Russia's intention to stop the gas transit through Ukraine in 2019. Then what are Europeans to do with their future energy needs while, unfortunately, some South East European countries still remain in a state of energy poverty? Why can it happen that the European consumers will be forced to use more expensive LNG, or even worse, liquefied shale gas from the US?